BUSY BEE RECORD was founded in 1904 by Sherwin Bisbee. These records were manufactured by the O'Neill-James Co of Chicago who issued both cylinders and discs, often with content licensed from other companies such as American Record Company, Leeds & Catlin, Hawthorne & Sheble, Zonophone, and Columbia recordings. Busy Bee Records were unique in that they featured a rectangular slot at the foot of the record which fitted over a matching lug exclusive to Busy Bee turntables. 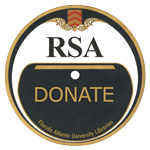 The term 'Amberized' (an early form of plastic) describes the type of material used for the manufacture of these recordings. 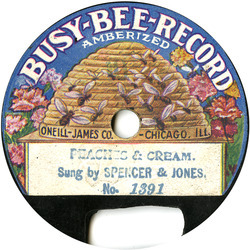 “BusyBee Record (U.S.A.) / c. 1906.” Ted Staunton 78 RPM Label Gallery. Ted Staunton 78RPM Label Gallery, 25 Jan. 2012. Web. 13 Dec. 2016.